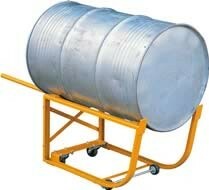 The tilting drum cradle provides a safe, ergonomical way to tip, drain & store 55 gallon drums. Convenient way to move any load to the job location. Enable one person to safetly lift a drum by themselves. Fitted with 2 fixed wheels and 2 swivel castors for maximum manoeuvrabiity. Extendable handles to reduce the required lifting force making for a safer and easier lift.